Sports Data Collection in a multi-task real-time environment. Transform visual sports information inputs into Data. Processing information into proper software. Correcting and adjusting scores and statistics during the game. Confirming the correctness of events. Reporting Data according to internal standards. Supervising Scouts and to assist them during their games. Communicating with a team of Supporters and Administrators. Patrol and inspection in the Costa da Prata concession highway infrastructures. Verify the fulfillment of the norms in the payment of the Portuguese tolls. While performing their duties the Inspection Agents can require the alleged infringement for his identification and if needed, he can order the vehicle to stop in order to notify the driver and request the immediate payment of the in debt toll tax and associated administrative fees. English vocational education and training. 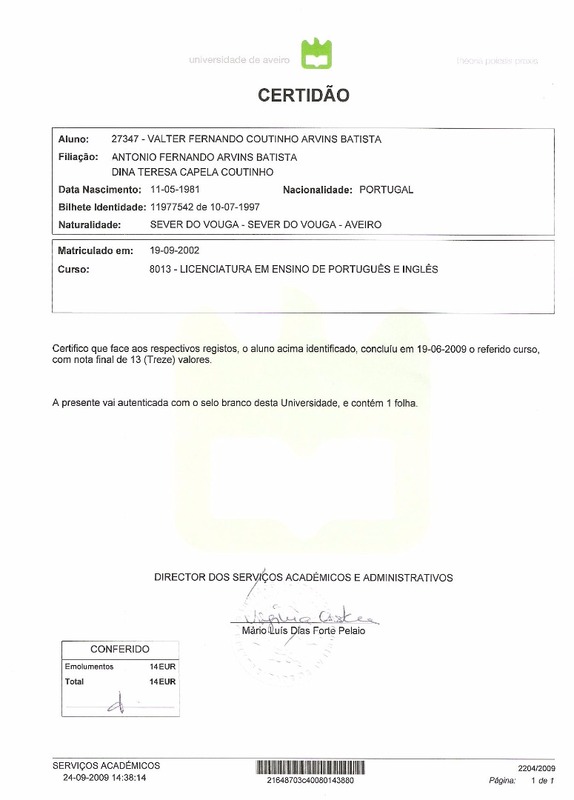 Portuguese vocational education and training. Portuguese or English language individual or group study with children from 7 to 13 years old. English or Portuguese explanations and guided study related to English or Portuguese school subjects. Commercial English vocational education in regional companies. Security Guard in Forum Aveiro. Portuguese and English language teaching to students from the 7th until the 12nd grade. Sociology of the Education and School. History of the Portuguese Language. Organization and Observation of the School system. Certificate of the degree completion. Written Understanding and Expression: Excellent. Oral understanding and expression: Excellent. Written Understanding and Expression: Fair. Oral understanding and expression: Good. Ease of using computer software and hardware. Excellent computer skills (HTML, Windows, Internet Explorer, Office (Excel, Word, Powerpoint).